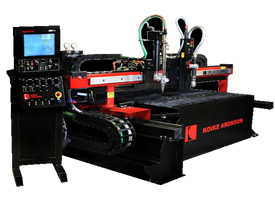 Koike Aronson | R.J. Kates Co.
Koike Aronson is a manufacturer of high quality metal cutting, welding and positioning equipment. 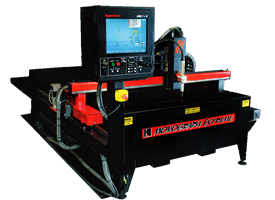 They have over 90 years of experience and have one of the broadest lines within the industries that they serve such as, Steel Service Centers, Heavy Equipment Manufacturers, General Fabrication Shops, Power Generation Plants, Shipyards and Offshore, Pipe and Vessel, Transportation and Educational Institutes. 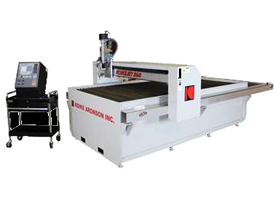 Their extensive line of equipment that they manufacture to assist these industries include CNC Oxy-fuel, CNC Plasma, CO2 Precision Laser and Waterjet cutting machines, Welding Positioners, Portable Metal Cutting and Metal Welding Carriages for various materials such as, mild steel, stainless steel, aluminum, armored plate, etc. along with high quality gas apparatus to provide excellent safety when operating our equipment. 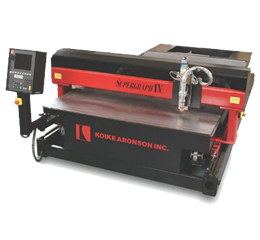 Both their Cutting and Positioner lines can be built standard or custom to a customer’s specifications.